If you are looking for a classic eccentric character that will make a great Halloween costume, you can't go wrong with Edward Scissorhands. Director Tim Burton is well-known for his eclectic films and unusual movie characters. One of the best films that showcases Burton's unique quirky style is his classic 1990 cult movie Edward Scissorhands starring actor Johnny Depp who gave a memorable performance as the sweet eccentric character cursed with scissor hands. Even 27 years after its theatrical release in 1990, both old and new fans still love to dress up as him for special movie screenings, cosplay events, costume parties, and Halloween. Edward Scissorhands makes a perfect timeless Halloween costume that everyone instantly recognizes for any dress up party. We have found some great sale bargains on this outfit available for sale online. We recommend that you treat yourself this Halloween by purchasing the Grand Heritage super deluxe version of the costume which is listed below. 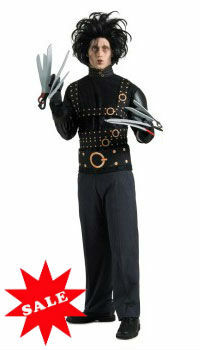 Dress to impress at your next Halloween party with this ultimate "Grand Heritage" edition of the Edward Scissorhands movie Halloween costume. This high quality adult men costume set features faux leather jacket, matching pants, boot tops, trademark scissor gloves, belts & buckles, black wig and makeup kit. Officially licensed and produced by Rubies costumes. 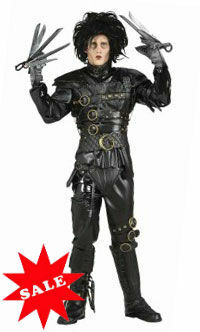 This men's Halloween costume features the jacket, foam scissor blade gloves, and a character wig. This lower cost version does not include the make-up and pants. Available in adult men's Standard size. This is the female Edward Scissorhands costume for adult women, featuring the black dress with attached sleeves, gloves with scissors, choker, wig, and belt. Women dress sizes x-small, small, medium, or large. This is the new Miss Edward Scissorhands costume for tween girls which features the dress, scissorhand gloves, belt, choker and black wig. 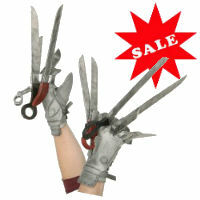 Tween Small is Bust 27" and Waist 24" - Tween Medium is Bust 29" and Waist 27"
If you want a deluxe Scissorhands gloves for your Halloween costume, we suggest this well-made set made for adults. 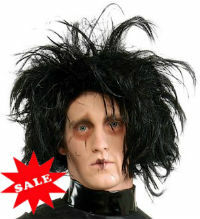 This the official Edward Scissorhands wig for adults. 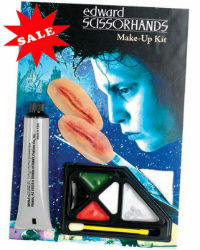 This is the official Edward Scissorhands makeup kit that will help you transform your face into the classic character. Director Tim Burton and actor Johnny Depp have worked in collaborations with one another for several years. But in the several films they have brilliantly worked together, their most enchanting collaborative work is the artificial man who has scissors for hands know as Edward Scissorhands. His costume is instantly recognizable and a favorite mystical costume at any Halloween party. The screenplay of Edward Scissorhands is one of the most intriguing stories every written. The character's tale was a roller coaster of emotions – fear, pity and affection for this poor creature. As Edward's master dies inside their hilltop castle-like abode, he has no choice but to explore the outside world unprepared. He was then taken in by a suburban family. As he works his way into the heart of each member of this family, he falls in love with the teenage daughter Kim, played by Depp’s then real sweetheart Winona Ryder. Edward started to put his diverse metal scissor, pliers and other gadget for hands to creative and practical use. Every lawn and backyard garden in the entire neighborhood has transformed into a magnificent artistic display of well trimmed plants. In any shape you could imagine, Edward trimmed the bushes into shapes of dinosaurs, playing children and other sorts of images. He even became the free resident hair stylist for all the ladies who wanted a rather quirky women hairdo. As you remember in the movie, all good things must come to an end. Suspicions soon arised from some of the paranoid members of this community and they soon felt threatened by Edward’s seemingly emotionless facial expression and dark personality. His critics set him up for a trap. As the whole town is overwhelmed with this unique and sometimes terrifying creature, Edward also finds himself overwhelmed with all the attention. He did not have any choice but to return to his castle and live alone, leaving Kim brokenhearted. Now if you want to give off that mysterious charm and likability, Edward Scissorhands costume is really the perfect ensemble costume for you.